A loan can very easily come between even the best of friends. Lending money to a friend can lead to a tricky situation where if anything were to go wrong it could drive a wedge between you and your friend and quite possibly end the relationship. As the person is your friend it can be quite difficult to ask them to repay the loan and ultimately, it is best to avoid lending the money at all. 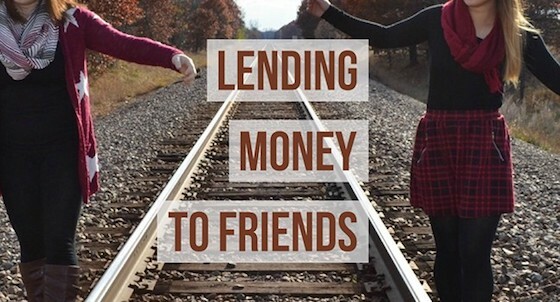 Below are some of the things that can happen when friends lend money to friends. In most instances, the friends do not reach an agreement for the repayment of the monies lent. The lender doesn’t know when the money will be paid back and the borrower doesn’t know when and how to repay the loan. This can lead to a stressful situation for both parties. The friend you lend money to may not take the repayment as seriously as with a loan via a banking institution. Without any strict deadlines, the loan repayment may become a low priority. Without any of the repercussions associated with a loan from a bank, the friend may not take the loan as seriously as he or she should and not take the repayment as seriously. It can be difficult asking the friend to pay back the money. The relationship between the friends may make asking for the money an awkward situation. This could lead to a breakdown in communication resulting in confusion and hurt feelings between the friends. When you lend the money to a friend, of course, you want the money repaid. But, what if you need the money back urgently? If you find yourself in a tight spot where you lose your income or an emergency crops up, if there is no repayment plan in place with your friend it could leave you in a financially compromised position. Lending money to a friend could have repercussions. You may not get back the money you loaned your friend and the relationship between you may never fully recover. The possible tension between you and your friend should make you think seriously about lending the money as difficult as it may seem at first. Lending money to a friend may cause social gatherings to feel uncomfortable to attend. Being in the company of the person you have loaned the money to could lead to awkward moments if the subject of money comes up. You want to be the best possible friend you can be, but the best rule of thumb is to not lend friends money. It can be a difficult decision to make, but with the best interests of your friend and your relationship in mind, it is best that you let your friend down gently without hurting their feelings. Rather help in other ways to assist with your friend's financial dilemma. In the long term, you will both find it was the right decision.